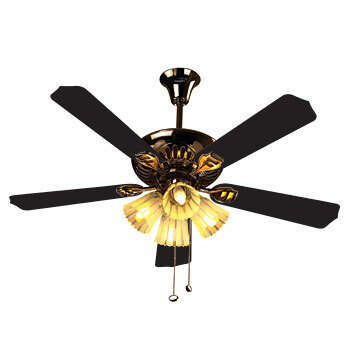 Move the air within the room, and keep your cool with this beautiful ceiling fan. This ceiling fan adds style and function to your coveted area in the house while maintaining a comfortable temperature as well as using energy efficiently. By choosing this one, you will be embracing and welcoming pure brilliance into your living space. The VGL Black from the house of V-Guard is everything that you and your room have been looking for from a long time. The understated, yet enchanting appearance of this wider aluminium bladed ceiling fan will capture the finishing touches of any area. The VGL Black is an elegant construction of motors and canopy with plated Gun metal finish and streamlined air flow to make living comfortably sweet for you. This fan is available in Black White Pearl finish, Sandal Black finish as well as a Chrome Black variant to give more beauty to your living decor. Use this handsome ceiling fan to cool your home and improve air circulation in the area around you. It won't make noise, look beautiful, compliment your decors as well as soothe you down when you feel troubled due to the soaring temperature.